A brief post today to share a remarkable scientific study on an unusual caterpillar behavior. In an earlier blog, I mentioned the unique sound-producing capabilities of the beautiful walnut sphinx caterpillar. What I had read is that the sound was produced to startle would-be predators. New research has refined this explanation. As reported in The Scientist (check it out to hear the caterpillar), a new study has shown the loud sound, created by the forcible expulsion of air from specialized holes along the side of the larva, is now believed to mimic the alarm call of birds. Some birds, such as black-capped chickadees, make special vocalizations when they see a potential predator. Other birds react by diving for cover. When this caterpillar is threatened, it emits a similar sound that can fool a hungry bird into thinking there is danger nearby, thus breaking off the birds’ attack on the larva. Amazing! 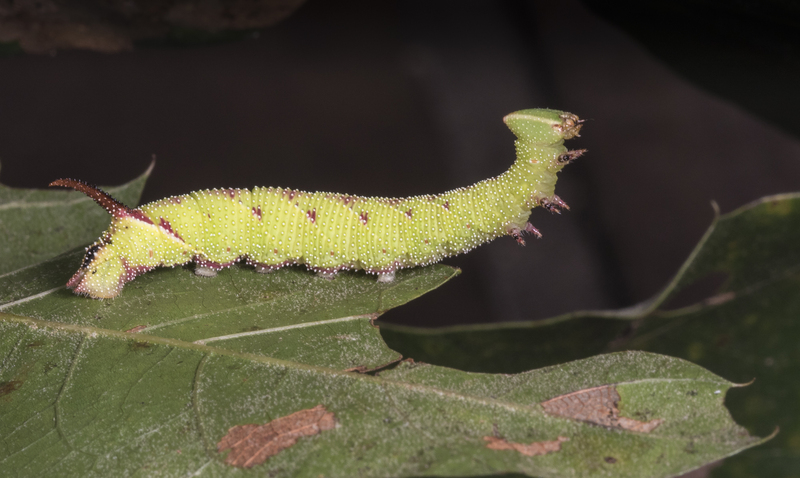 This entry was posted in Natural History and tagged caterpillar defenses, walnut sphinx caterpillar by roadsendnaturalist. Bookmark the permalink.